We are back in full swing for the Fall! Our new hours are announced. We had some exciting developments over summer and more to come in the Fall. 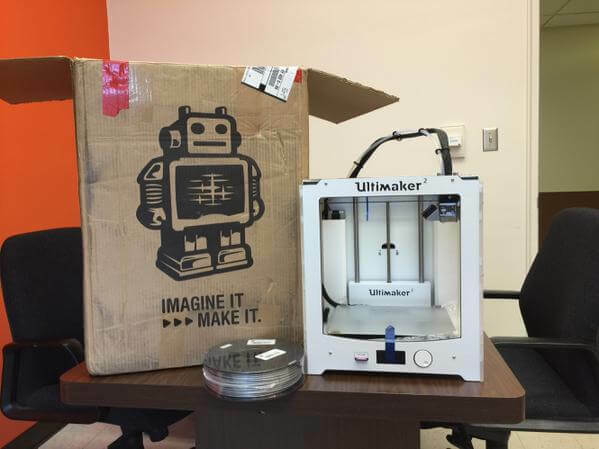 We have recently received an Ultimaker 2 for testing, and are working on a partnership with Ultimaker, which will help us change all our printers cost effectively, which have clocked in more than 25,000 hours of printing over the last two years. We had a great summer, with several workshops in our certificate series, forty workshops by the MakerGirls, and our first ever High School robotics and 3D printing workshops. We also introduced and had our first birthday party at the Lab, and the children made their own return gifts, while learning 3d Printing! Upcoming for Fall : We look forward to hosting the MakerGirls again for about eighty workshops over the Fall/Spring and Summer semesters in 2015-16. We will launch our own workshop certificate series again in the latter half of September. We will be launching a new Autodesk Fellows program, where our Guru's trained by Autodesk, will offer workshops in Autodesk Fusion 360. Learning this tool will allow you to participate in the "Design for Autodesk" campaign, where you can earn $250 for every accepted design. Sign up for our newsletter(right side bar) to stay updated. We are also organizing a 3D printing conference in November, tentatively for Friday the 13th. Details to be announced soon.